Holidays, especially Christmas, are one of the most hectic times of the year. Friends and family come and go in your house. Your kids are on their school break and are wreaking havoc to your carefully-adorned living room. You’re running around doing errands, wrapping gifts, etc. All that chaos is part of the hustle and bustle of this festive season. Honestly? It’s what makes everything so fun! Chances are, your guest room served as your storage room before this time. It’s likely filled with dust and smells like… well, it smells like no one has lived there for a while. So open those windows, dust the furniture, turn over that mattress, and change those sheets and pillowcases. If you find that your mattress has seen better days, consider getting a new mattress. As for bedding, you know that more is better. Pile up a stack of extra blankets and pillows near the bed. Your guests will appreciate having the option to cuddle under layers of comfort so they can get a good night’s sleep. Don’t forget to spritz a bit of linen spray - like lavender or orange blossom - so everything smells oh so clean and fresh. 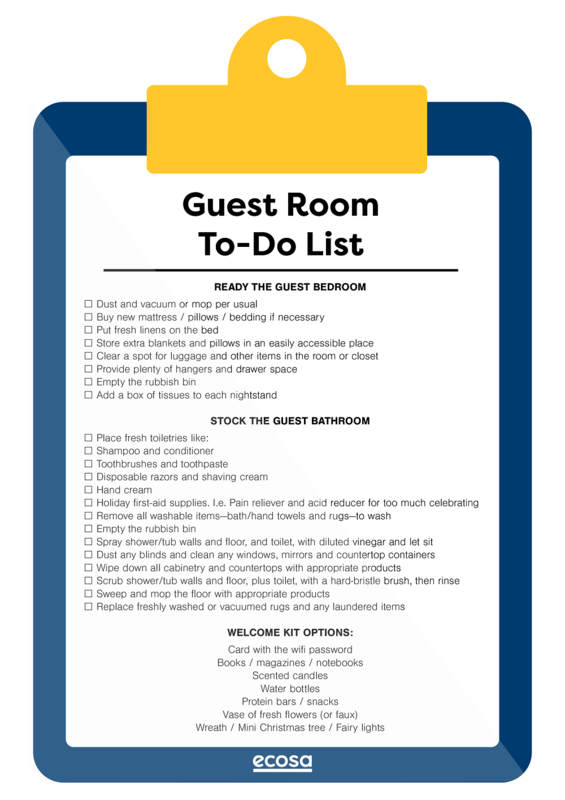 Although you can expect your guests to pack their own toiletries while travelling, it’s a nice gesture to make sure your guest bathroom is stocked with the essentials. This is especially helpful for guests who travel light and may not have brought a lot of toiletries with them. You’ll want to put shampoo, conditioner, soap, and toothpaste. Clean towels are also a must. If you’re feeling a bit extra, why not throw a toilet spray in there and some nicely-scented lotion? Whether you go all out with a basket of fancy skin care or a basic set of hotel samples, know that your guest will surely appreciate the gesture. And it’s full of clutter. Not a nice view is it? As host, you should definitely schedule a time to clear out the things in the bedroom. Empty the wardrobe so your guests can hang their clothes. Empty the drawers so they have a place to put their gadgets or, if they have kids, babywear, etc. You’ve taken things out. Now let’s bring things in. A nice welcome kit filled with little well-thought-out items truly makes a big impact. You may want to give them a card with the wifi password, for example. Perhaps some water bottles to refresh themselves when they arrive or some scented candles for a luxurious bath time. You can even put interesting reading materials on the bedside table so your guests have something to peruse on their downtime. The key thing here is for you to anticipate your guest’s needs and prepare something special for them. This is can be as simple as hanging a wreath on their door or placing a miniature Christmas tree near their window or decorating their bed frame with fairy lights. Something Christmas-y that brings some holiday spirit to the room. These simple touches can go a long way in making your guests feel welcome! Christmas is a time for giving and sharing, of showing your gratitude to family and friends. It’s the one time of the year when you can go all out with the decorations and items to spoil your loved ones. So, don’t hesitate. Show your guests some love!